4 AC Outlet 230V International Surge Suppressor. For more than 20 years, America's leading companies have trusted Tripp Lite's Isobar Premium surge and noise suppressors to protect sensitive computer, networking and telecom equipment. Robust surge suppression circuits with sine-wave tracking offer extreme levels of protection against the heaviest surge conditions exceeding IEEE 587 category A & B specifications. Isobar’s exclusive isolated filter banks remove EMI/RFI interference, even noise generated by other pieces of connected equipment. EURO-4 offers 4 outlets arranged in two filter banks to prevent system crashes, reboots and performance problems common as noisy system peripherals are powered off and on. Surge suppression rated at 330 joules offers network-grade protection. 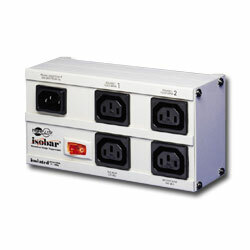 Widely spaced IEC320-C13 outlets accommodate up to 2 large transformer plugs without blocking outlets. Detachable IEC-320 C14 inlet connection accepts a variety of detachable cordsets to match country or site-specific wall receptacles. Two-meter C13 to C14 interconnection cable and keyhole mounting tabs included.